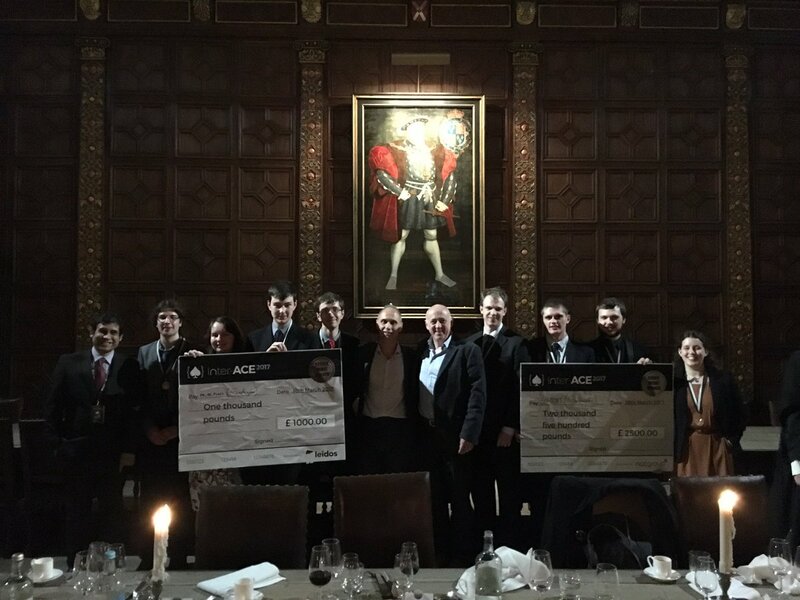 This year saw the return of the national Inter-ACE competition hosted by the University of Cambridge. There were 26 teams of up to four competing from 11 ACEs, including some of the top universities in the country, representing the best of the young cyber-security talent. This year there were also cash prizes available for the top three teams, making the competition extra fierce. Su-Don't: Io Swift Wolf, Kajusz Dykiel, Laurie Kirkcaldy, Tom Charter. After an early start, the day kicked off with introductory talks from two of this year's sponsors - Leidos and NCC Group. After these brief but insightful keynotes and a brief explanation of the platform, we had a break for lunch (and scheming). Shortly after this, the competition itself began. The competition was composed of two main areas: a network exploration, exploitation and defense challenge and a digital forensics challenge. For the first part, the goal was to take control of as many hosts on the challenge networks as possible, while trying to prevent other teams from capturing the same boxes. This involved fixing vulnerabilities that would give other teams access, whilst leaving secure backdoors in the system to use if another team found a different way to get into the box. The challenge networks contained a mixture of Windows and Linux machines. Southampton team Su-Don't gained an early lead by capturing a number of hosts, focusing on the Windows machines, and maintained them for the majority of the competition. For the forensics challenge we were provided with a 24GB hard drive image and clues to 39 flags. These were hidden inside images, deleted files, registry keys, and a whole host of other locations. Some were encrypted using classical ciphers, others were encrypted using more modern cryptosystems such as NTLM and TrueCrypt. In the forensics challenge, a good portion of challenges came from a packet capture. This involved challenges such as finding out the location of a web server, extracting SSL keys from the hard drive image to view images transferred via SSL in the packet dump. We also had to determine the commands that had been run on an FTP server, and discover information about the network topology from the routing and host discovery traffic. Both elements provided plenty of challenges for the teams, as we fought to take boxes off each other and raced to defend the boxes we captured before they could be taken by any other teams. With one hour remaining until the end of the competition, the live scoreboards were switched off. This was done to maintain the mystery of the winning teams, which would be announced later in the evening after the formal meal. Before leaving the competition room, the results of a timed lock picking challenge which had taken place earlier in the day were announced. We were delighted to find out that Kajusz (of Su-Don't) had achieved the shortest time overall, winning the challenge, picking the lock in just four seconds. We then made our way to a drinks reception at Trinity College which was followed by a five course meal, served in the historic Great Hall of the college. During this, we had the opportunity to mingle with fellow competitors and the sponsors of the event. At the end of the meal, Frank Stajano gave a speech, thanking the sponsors and organisers of the event as well as all the competitors. He then announced the winners of the competition. Congratulations to team QWERTY from Imperial College London who took first place. Congratulations also to team Ox002147 from Oxford, who were selected to receive the "Je Ne Sais Quois" by NCSC for their undying devotion to completing the forensics challenges. Both Southampton teams managed to place in the top 3 as well, with Su-Don't coming in 2nd place and PM_ME_FLAGS taking 3rd. In addition to the cash prizes and national recognition, we were presented with amusingly large novelty cheques to take home. Interestingly, it was mentioned to us that only four teams had managed to capture any of the boxes on the network during the competition, with those four teams being the top four teams in the final ranking. Finally, closing the evening, Leidos gave a speech about their hopes for our generation, with Frank Stajano wishing everyone a safe journey home. We would like to thank Frank Stajano, Graham Rymer and Michelle Houghton from Cambridge for organising the event for a second year running, the representatives from Leidos and NCC group for providing the competition infrastructure and sponsoring the event, and all the staff who helped keep the contest running smoothly. As additional sponsors, we would like to thank the NCSC and UK Cabinet Office for their contribution to the event. From the University of Southampton, the Cyber Security group provided tuition, inspiration, vision, infrastructures and continued support; for this we would like to give particular thanks to Vladimiro Sassone and Oli Bills. Southampton University Cyber Security Society (SUCSS) provided a wonderful context for us to get together and prepare in the weeks leading up to the event. Thanks also to Sadek Ferdous and Sarah Martin for organising our trip to Cambridge. Members of the two teams are going on to compete in a CTF and coding competition early next month at the National Conference for Learning and Teaching in Cyber Security, hosted by the Higher Education Academy and taking place at Liverpool John Moores University. We are also entering a number of people into this year's Cambridge 2 Cambridge competition, run jointly by the University of Cambridge and MIT. As well as the members of the two existing teams (who qualify automatically due to placing in the Inter-ACE), our experience at the competition inspired a number of other students at the University to join the Cyber Security Society and enter the qualifying round themselves. We hope to see as many of them at the C2C event as possible! All content copyright SUCSS © 2019 • All rights reserved.